Units: 1,177 residences and a 150-key Marriott Residence Inn hotel. 90 Columbus (Approved for 634 rental apartments): Still in planning stages. Anticipated groundbreaking in 2016 with Completion in 2018. 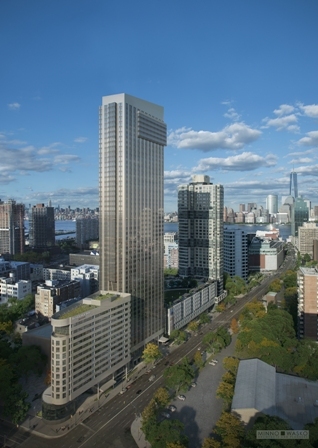 70 Columbus is located at 70 Christopher Columbus Drive in the heart of the Grove Street Path area of downtown Jersey City. Currently under development by Ironstate Development Company and Panepinto Properties, 70 Columbus will be a 50-story rental apartment building containing 543 luxury apartments offering studios, one-bedroom, and two-bedroom floor plans; and 14,667 SF of retail space with the majority of the space for a Sunac Natural Market which offers high-quality natural and organic foods, along with other socially- and environmentally-responsible products that will benefit the community at large. 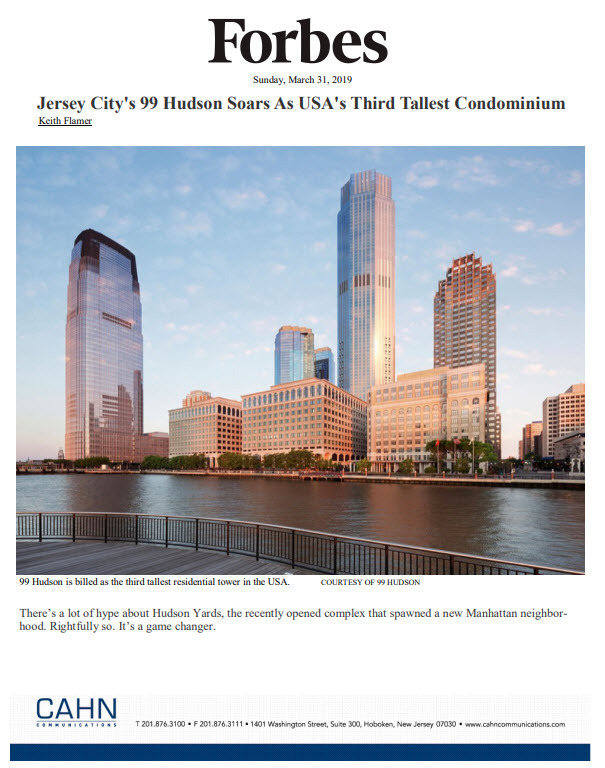 The iconic high rise tower, scheduled to be completed in the fall of 2015, was designed by prominent New York firm Gwathmey, Siegel, Kaufman and Associate Architects (GSKA). The building will feature unobstructed views of the Hudson River, the Statue of Liberty, and Downtown Manhattan. Interior amenities designed by Neonata include a signature attended lobby with iconic fireplace lounge and complimentary Wi-Fi throughout, a billiards room, a multi-media theater, a catering kitchen, and multiple Wi-Fi enabled lounge areas. There’s also a landscaped roof deck including a pool, grilling / BBQ stations, a sport court, a dog run, and an outdoor kid’s play area. 70 Columbus will offer residents excellent access to both sides of the Hudson River. Residents can be in Manhattan within minutes via the PATH train (Grove Street Station), and the Holland Tunnel. The Grove Street PATH station is literally located just a few steps away from the building’s luxurious lobby, allowing for a seamless, door-to-door transportation option from the property to Manhattan, Exchange Place, Newport, and Newark International Airport, to name a few. The project is also within in walking distance to JC’s burgeoning downtown office market. 70 Columbus is the second phase of a four-phase project designed to bridge the gap between the waterfront and the Newark Avenue Business District. The success of 50 Columbus, which saw all 400 units leased up within the first year, paved the way for a more livable city. 70 Columbus will further that initiative by providing thoughtfully-designed residences, forward-thinking amenities and complementary retail services that will attract today’s professional and creative classes while further energizing the overall neighborhood. The project’s final two phases include additional rental residences and a 150-room Marriott Residence Inn which will provide much-needed hospitality services to Jersey City. As part of the overall project, the development partners worked with the Port Authority to improve the area’s public transportation hub, including a rebuilt Grove Street PATH Station integrated into the residential housing that provides residents with excellent access to both sides of the Hudson River. The result is a comprehensive development that will continue to strengthen downtown Jersey City’s housing and public transit infrastructure while offering a world-class residential destination that meets its world-class Jersey City setting.